Postcard for the Societa di Navigazione titled "Italia," Crociere 1937. "Italy," Cruises, 1937. Signed "Erberto Carboni, 1937" Travel Brochure for Monte Grappa. Published in 1934 by the Enyr Nazionale Industrie Turistische (ENIT - Italian State Tourist Department) and the Ferrovie dello Stato (Italian State Railway). Signed "C.V. Testi." Travel brochure for Rome published by the Direzione Generale per il Turismo, Ferrovie dello Stato (Italian State Railway) in 1936. Signed "Istituto Italiano d'Arti Grafiche - Bergamo." Travel Brochure for Venice, published in 1933 by the Ente Nazionale Industrie Turistische (ENIT - Italian State Tourist Department). Signed "Treves - Treccani - Tumminelli." 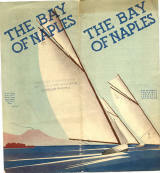 Travel brochure for the Bay of Naples, circa 1935.Nazionale Industrie Turistische (ENIT - Italian State Tourist Department). Signed "Novissima Roma." Travel brochure for Umbria, published in 1933 by the Ente Nazionale Industrie Turistische (ENIT - Italian State Tourist Department). Signed "Novissima Roma." Travel brochure for the Surroundings of Rome. Published circa 1933 by the Ente Nazionale Industrie Turistische (ENIT - Italian State Tourist Department). Signed "C.V.Testi - Novissima Roma." Travel brochure for the region "Veneto e Regione Giulia" (Czech version "Benátsko a Přímoři"). Published in 1933 by the Ente Nazionale Industrie Turistische (ENIT - Italian State Tourist Department). Signed "Roma - Soc. Tip. Castaldi."